With the final two weekends of football upon us nachos should be very much on your brain. 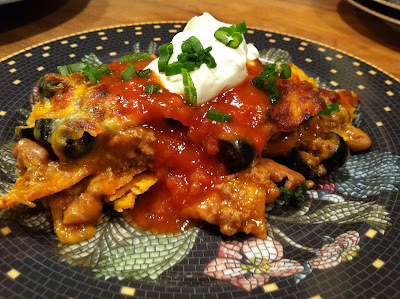 Amazing nachos are all about the layering, you don’t want any naked chips. Start by preheating your oven to 450 and then combine a can of enchilada sauce and a can of pinto or black beans in a small pot on low heat. In a frying pan cook a pound of your meat of choice; ground beef, braised brisket, chili, or Italian or pork chorizo sausages. I simply split them down the middle to remove the casing and they easily broke apart while cooking. Turn off the heat once the meat is cooked. There’s going to be two layers, begin by covering the bottom of a cookie sheet or large oven proof dish with your favorite tortilla chips. Following, spoon about half of both your enchilada bean sauce and meat mixture evenly over the chips in addition to a little shredded cheese, I like the Cabot Fancy Blend of Mozzarella and Cheddar. Pile on the rest of your chips then spoon out the rest of your sauce and meat before covering completely with the shredded cheese, and I mean completely, no skimping on the cheese. Bake for ten to fifteen minutes then when the cheese has completely melted finish off under the broiler for just a minute. Serve with sour cream, chopped scallions, avocado, and your favorite salsa. If you like your nachos on the spicy side add some hot sauce to the enchilada sauce and beans, this way the heat will be spread throughout.